Catalogue of Organisms: Gnah! Gagrella! Headdesk! 'Gagrella' splendens - is this the face of Evil? Photo by sswroom. Please permit me to vent some frustration. 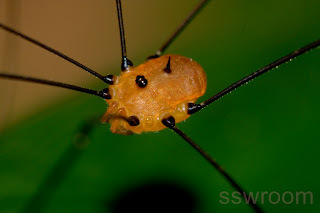 I've written before about the ghastly legacy left to many areas of harvestman taxonomy by the work in the first half of the 1900s of Carl-Friedrich Roewer, henceforth referred to as the Antichrist of Arachnology, through his use of artificial classification systems and slipshod taxonomy. In the past, I personally have managed to remain relatively unscathed by the dark influence of Roewer, who did not deal much with the Australian opilionidan fauna. In the last few days, this has sadly changed dramatically. I have found myself wandering into the toxic wasteland that is Gagrella. 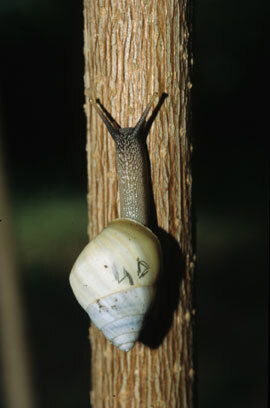 The Gagrellinae are a sizable subfamily found in tropical and subtropical Asia and the Americas. The centre of diversity for the subfamily is in Asia, whence about 700 species have been described. Many of these species are exceedingly colourful, strikingly ornamented and just downright remarkable. The problem is that most of the Gagrellinae, including Gagrella itself, have not really been revised since Roewer's massive investigation of the group, culminating in a monograph of the Asian Gagrellinae published in four parts over 1954 and 1955. 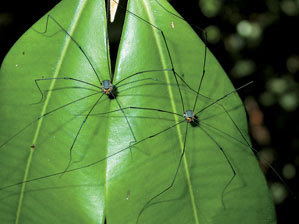 As with other groups of harvestmen, Roewer used an artificial classification system based on characters such as the numbers of nodules in the legs or spines on the carapace - characters which have sometimes since been shown to not even be consistent between members of the same species, let alone the same genus (there are specimens of other taxa that, if one was to use Roewer's identification system, the left side of the animal would key out as one genus while the right side would key out as another). It is therefore quite likely that, were a full revision to be conducted, many species would have to be placed in different genera from their current position. With, as I said, about 700 species involved, this would be a mammoth task. And yet there is a second layer of ghastliness, to make the problem even more difficult. Of the species assigned to Gagrellinae, a little less than 200 have been assigned to the largest genus, Gagrella. The type species of this genus is one Gagrella signata. However, when Roewer worked on the genus, he moved G. signata out of Gagrella and into another genus, Crassicippus, leaving the remaining species as Gagrella. Because the genus name is required to always stay with the type species, this actually meant that what Roewer called Crassicippus should have been called Gagrella, while what he called Gagrella should have been something else! Unfortunately, almost all authors following Roewer used his inaccurate sense of Gagrella, meaning that of those nearly 200 species, none of them actually belong to Gagrella unless they happen by coincidence to have been placed in the wrong genus and are actually closer to G. signata. Unidentified South American Gagrellinae, congregating suspiciously. Photo by Bruno Buzatto. Under strict application of the rules of nomenclature, what is now 'Gagrella' should actually be called Hexomma, that being the oldest genus name synonymised with Gagrella sensu Roewer in the past (Crawford, 1992). Unfortunately, the name Hexomma has been used as a valid genus in all of about three publications since it was first published back in 1876. Also, there are serious doubts about whether the type species, Hexomma vulcanicum, is actually identifiable - Roewer (1954), who may or may not have seen the type specimens*, claimed it to be based on unidentifiable juveniles, and the type specimen(s) seems to have since gone AWOL (Crawford, 1992). *Roewer (1954) claims to have examined type specimens that he had borrowed from Vienna, but then eight lines later lists "Holotypus (Thorell) (Mus. Stockholm, Genua?)". As the Vienna specimens were correctly attributed to Doleschall rather than the later Thorell (albeit from the wrong publication), the Vienna record seems more likely to be accurate. Thorell later redescribed Hexomma vulcanicum as Gagrella vulcanica, and the Stockholm/Genoa specimen listing probably refers to the specimen used by Thorell for the redescription (and so not actually a holotype). Move everything currently in Gagrella to Hexomma: Probably not that good an idea, considering that Hexomma is not a well-defined genus and many (if not most) of the species will end up having to be moved out anyway. Conserve the definition of Gagrella as used by Roewer: One option might be ask the ICZN to conserve Roewer's usage of Gagrella. Under normal conditions, this would be ideal, but in this case much the same issues apply as with the first option - what's the point with conserving Gagrella in its current condition if most of the species are probably going to end up having to move anyway? Crawford, R. L. 1992. Catalogue of the genera and type species of the harvestman superfamily Phalangioidea (Arachnida). Burke Museum Contributions in Anthropology and Natural History 8: 1-60. Roewer, C. F. 1954. Indoaustralische Gagrellinae (Opiliones, Arachnidae). (Weitere Weberknechte XVIII). 1. Teil. Senckenbergiana Biologica 35 (3-4): 181-236. What on earth possessed Roewer jettison the type species? It may or may not amuse you to know that his name sounds rather rude in Swedish, apparently containing röv "arse". In later publications Roewer justified his deliberate misuse of the name Gagrella by pointing out that by his doing so, the name remained with the majority of species that had been called so up to that time, rather than being transferred to a much smaller genus of only five species (if I count correctly). It is worth noting that the significant majority of the species that were thereby retained in the genus Gagrella by Roewer had been originally placed there by Roewer himself. That third option is looking increasingly attractive to me, too. How much room is there in the wet collection for foetal-position wimpering PhD students? Option 4: SQUASH ALL BUGS! "(there are specimens of other taxa that, if one was to use Roewer's identification system, the left side of the animal would key out as one genus while the right side would key out as another)"
As a practicing taxonomist myself, I COMPLETELY sympathize with you! Unfortunately, you need to maintain stability until a decent revision is done (final PhD chapter?) of all the characters, hopefully with an additional molecular phylogeny based on multiple markers. you don't want to make things harder for yourself or future workers by confounding the genera (yes I know its already confounded). Actually was faced with a situation where the type specimens all the species in a genus were too ambiguously defined or in too poor condition to observe the same characters the original taxonomist documented. We ended up describing notes on it but not appending a name to it until a revision of th genus is completed so the names become properly defined. Does this work in your situation? Nuke them from space. It's the only way to be sure. This could apply to opilionids or opilionid taxonomists. The choice is yours. Taxonomy is the least of you bugmens' problems. The impulse to run screaming in horror is probably just a displaced case of "the willies". Seriously, arthropod genera are collectively little better than dustbins. Refer all your specimens to "spuriosidae/spuriosa" and let our machine successors sort it out. They won't really be interested, but their distaste at the disorder will motivate them to finish the job properly. In a conversation with (read: royal whinge to) a colleague on this subject a couple of days ago, I briefly calculated how long a thorough revision could take. Let it suffice to say that it would be closer to 70 than 20 years. Normally, I would agree with you, but as indicated in the post, in this case stability is nonexistent. Not really. It is exactly because this situation has been allowed to remain in the too-hard basket that the confusion has been allowed to persist. A comparable model may be the similar mess left by Roewer with regard to the South American laniatorean harvestmen. In that case, a process of slow chipping by recent workers has made great progress in moving the system to a firmer footing. I suggest you get at least half of your colleagues worldwide together, found something comparable to the Angiosperm Phylogeny Group, somehow land a major grant, and revise the whole mess at once. Any slower approach would only protract and expand the confusion. Now, how many people worldwide work on harvestmen? Three? Ten perhaps? BTW, the name is probably northern so-called German and means "robber". "In a conversation with (read: royal whinge to) a colleague on this subject a couple of days ago, I briefly calculated how long a thorough revision could take. Let it suffice to say that it would be closer to 70 than 20 years." Several 700 species taxa have been revised in quite reasonable amounts of time. 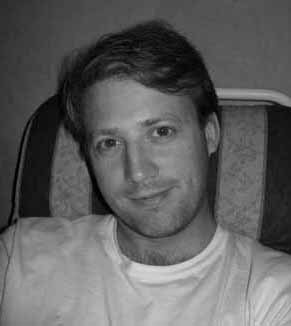 Ed Wilson revised new world Pheidole in somewhere around 7 years of part time work, including descriptions of a large number of new species. Delvare revised Conura (formerly Spilochalcis). I suspect that your estimate may be way high. Back to the Scleritome - Tommotiids Revealed! Implications of Aetogate: Who Owns the Data?